In its national security and national defense strategies, the Trump administration proclaims the return of competition between great powers, states with the ability to wield influence on a global scale. Specifically, the administration focuses on China and Russia, both of which "want to shape a world antithetical to U.S. values and interests" and "consistent with their authoritarian model—gaining veto authority over other nations' economic, diplomatic, and security decisions." Countless experts and commentators have also warned about the reemergence of long-term, strategic rivalry, arguing that American foreign and defense policy need to shift from countering terrorism to countering Beijing and Moscow's expansionism. This notion is no abstract idea. Indeed, such global competition is currently playing out in the political crisis Venezuela, whose outcome can set the tone for this new and dangerous era of great power competition—for better or for worse. In a new interview with Foreign Policy, four-star Adm. Craig Faller, the commander of U.S. Southern Command, explains how China is waging a disinformation campaign designed to blame the United States for the recent blackouts that have ravaged Venezuela. "China came out publicly, a state spokesman, implying the blackouts were attributable to U.S. cyberattacks," Faller said. "That is just such a blatant lie. The blackouts are attributed to [embattled Venezuelan dictator Nicolás] Maduro's inept leadership, corruption, inattention to his people, and lack of concern for any humanity." Maduro has similarly accused the Pentagon of causing the blackouts. Beijing, which supports Maduro's regime and his claim to the presidency, has offered to help Venezuela restore its power grid. 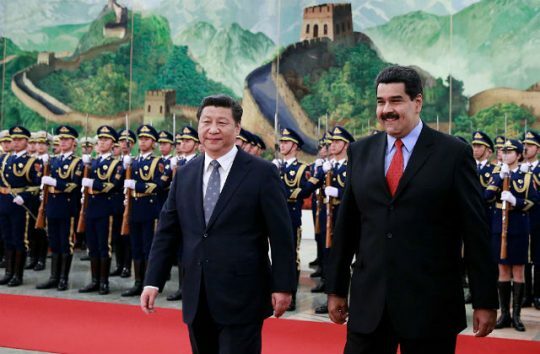 China is a key reason why Maduro remained in power, despite overseeing Venezuela's economic and social collapse through failed socialist policies and authoritarian rule. China is also a key reason why Maduro is still fighting to maintain power, despite dozens of countries, including the United States, recognizing Juan Guaidó, the leader of the legislature, as Venezuela's legitimate interim president. Indeed, Beijing has provided significant political and economic support to Venezuela, including billions of dollars in loans to keep afloat the cash-strapped country. [Fuller] said China was trying to assert economic control in Venezuela by investing in infrastructure and providing hefty loans that Caracas would have difficulty paying back. Much of Beijing's financial interest in Venezuela is tied to loans-for-oil deals struck between the two countries in 2007. By 2014, the China Development Bank had provided Venezuela with more than $30 billion in loans tied to oil production. For China, such economic leverage is not just about the financial benefits and obtaining resources; it is also about entrenching Chinese influence, gaining political and diplomatic power. China, like Venezuela, also fears the spread of Western values such as democracy and human rights. As I wrote earlier this year: "Autocrats want to stay in power above all else, and both Beijing and Caracas see the United States working to subvert their legitimacy and political systems. For China, Maduro's ouster would be a defeat for their oppressive alternative to Western democracy and capitalism." Perhaps that is in part why Chinese telecom giant ZTE Corp is helping Venezuela replicate China's dystopian surveillance state to ensure total government control over society, and why Beijing has sold more than $615 million in weapons to Venezuela over the last 10 years. Above all, China is committed to undermining the United States wherever it can, while pushing to supplant the United States as the center of power in international affairs. With this idea in mind, supporting an anti-American ally only three hours from Miami by plane makes perfect sense. China is not the only great power backing Maduro. Last month, Russia sent planes carrying about 100 soldiers and 35 tons of equipment to Caracas. While the soldiers, described as a "rapid deployment force," were there ostensibly to repair Venezuela's Russian-supplied S-300 air defense systems, the deployment is troubling nonetheless. Meanwhile, many observers believe that Russian military contractors and mercenaries are in Venezuela providing active support to Maduro's regime. Like China, Russia has deep economic, political, and diplomatic ties with Venezuela. Russia has sold billions of dollars worth of military equipment to Venezuela in recent years, and Moscow has invested heavily in the Venezuelan oil sector. Russia has obvious, concrete interests at stake in the current political crisis. But, more importantly, Moscow shares Beijing's aversion to American efforts to promote Western values and its desire to undermine the United States at all turns. After all, both China and Russia seek to overturn an American-led world order in which they have felt disrespected and mistreated. While China and Russia are providing extensive support to Maduro, the United States considers him a usurper and an illegitimate leader. The Trump administration is still considering a military intervention to depose Maduro so that Guaidó can lead Venezuela on a path toward democracy. The ongoing crisis in Venezuela is clearly a manifestation of the great-power competition that so many voices are warning about. Events in Venezuela over the next several months will set the tone for how this geopolitical rivalry plays out going forward. Surely Maduro staying in power will only embolden Beijing and Moscow to further undermine American interests and security around the world. And surely Guaidó emerging as the unchallenged interim president, to steer Venezuela on a freer, more stable path, will bolster America’s position at the expense of Beijing and Moscow. It is simple: if Maduro stays in power, China and Russia win this round; if he leaves, the United States wins in Venezuela, at least for the time being. Perhaps looking at the Venezuelan crisis in such zero-sum terms is unpleasant, but that is the reality of the situation. The Trump administration has said its great focus abroad is great power competition. Well, that competition is fierce right now in Venezuela. The outcome will have consequences far beyond Latin America. This entry was posted in National Security and tagged China, Nicolas Maduro, Russia, Trump Administration, Venezuela. Bookmark the permalink.